Alan Foster, Operations Director at McLaren, came to Huddersfield in style on May 20th driving a P650S Spider and delivered an inspirational speech about his career to the team at Reliance Precision. Coming from what he described as an “ordinary” background, Alan left school at 16 and began working with Ford as an apprentice toolmaker, earning just £17 a week. With a natural gritty determination and “an obsessive approach to quality and improvement”, a hugely successful career has followed spanning a 35 year period across many disciplines in the automotive industry. Various senior roles with Toyota and GM have found him in his current position as Director and Brand Ambassador at McLaren where he now helps head up a business with an annual turnover of around £500m. Addressing Reliance employees, Alan presented a whistle stop tour of the McLaren story interwoven with a series of fascinating career anecdotes. With infectious enthusiasm, he told proudly how he worked his way to the senior role of Operations Director at McLaren. His extraordinary career path captivated the workforce at Reliance, especially the apprentices who were clearly motivated by the key message that it is possible to reach the top, not by chance or luck, but through sheer hard work, passion for the job and self belief. Commenting on his earlier tour of Reliance, Alan was impressed by the innovative approach taken by the company’s policy of continuous investment, even during difficult trading conditions. James Selka, a director of the holding company at Reliance, thanked Alan for his visit and for his inspirational words of advice. 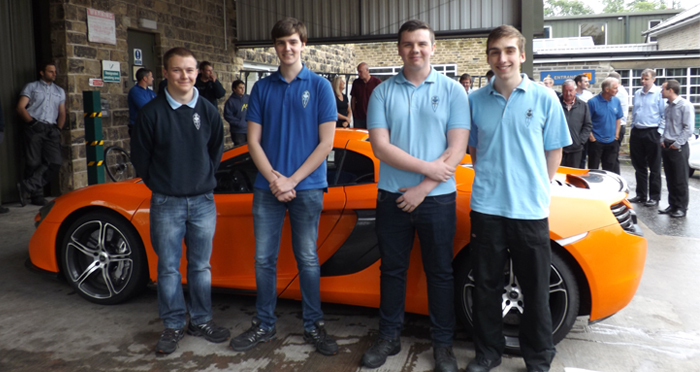 The apprentices were invited to view the McLaren sports car prior to Alan’s departure. Reliance Precision Limited is a specialist engineering company, with over 50 years’ experience in providing custom-built, high reliability, precision instrumentation to customers from a diverse range of global markets. We offer capabilities in design, development, prototyping, manufacturing, assembly and test, complemented by a range of catalogue components and assemblies.